Speaking of Work – Did You Get Your Free Copy? company also engaged world-class authors in an impressive project called Set the Page Free. 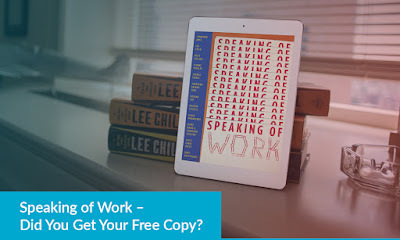 Speaking of Work, is now available for free download, as well. Who Worked on Speaking of Work? Many of the creators who contributed to Speaking of Work hail from the world of literature. I Was Told There'd Be Cake) contributed. and uses the framework Xerox provided to tell it. Xerox dedicated eight technologies to the making of Speaking of Work. that each user has complete control over who, how, and when their data is shared. workflow that produced this book. on-the-spot translation for easy and accurate cross-cultural communication. resources anywhere they go, allowing for unprecedented on-the-job flexibility. by allowing the entire team to integrate intuitively with Google Drive. with entirely different workflows could easily communicate with each another. illiteracy is eradicated and education is available for everyone. to people living in areas without access to libraries or sufficient municipal infrastructure for literacy. children and adults to learn to read and write. Are you ready to set the page free and implement on-the-go creativity for your employees? Talk to a QBSI-Xerox expert about your needs and we'll develop a Xerox-powered solution for you.